14 boats turned up to Wheecher Reservoir to contest the latest round of the ND IOM Winter Series, in spite of forecasts of 40 – 50 mph of wind and possible sleet. As it turned out, we were lucky enough to have sun most of the morning, and enough wind to mean everyone used rig 3, but not so much that walking into the wind was painful. I arrived with a car full of warm clothing, and my deep sea Antarctic clothing proved too hot, so it got shed as the day went on. Boats turned up from all points of the compass in the Northern District, well done to Tim Long who travelled nearly 200 miles each way in the day to attend, with Geoff Martindale travelling almost as far. With a race officer of the calibre of John Tushingham, ably assisted by the regular team of helpers, you would expect an excellent event, and that is exactly what we got. The course comprised of a long beat to the first mark, taken to starboard, a fetch to a hitch mark and a run back to one of the start marks, twice round with a beat to the finish. Getting a good start and a good first beat was often critical, and for most of the morning Tim Long did just that, and as he said, he seemed to be pointing higher and footing just as fast as the boats around him. 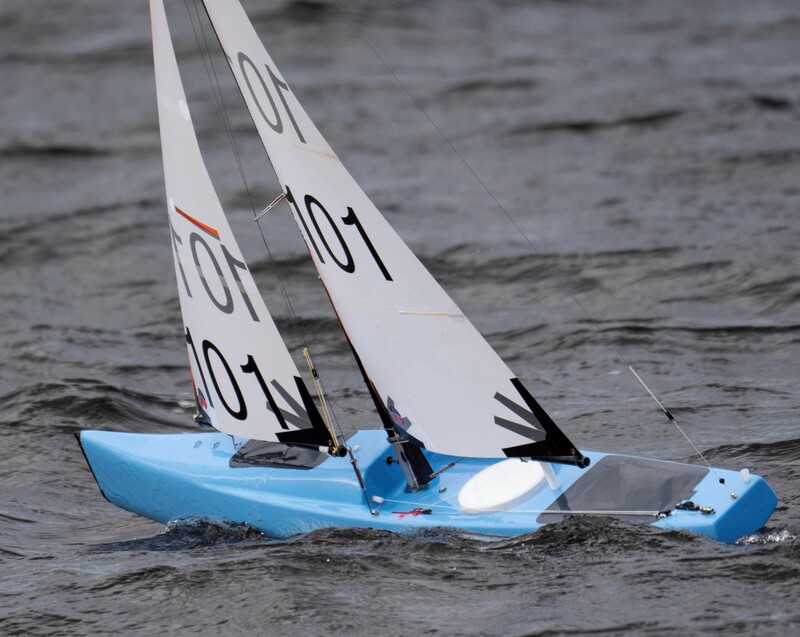 After the first batch of races, John Taylor, in his own designed wooden Rubix did a few tweaks to his boat and got good starts and from then on he was the man to beat, particularly after the lunch break. He was impressively fast downwind, and also quick upwind. Talking of lunch, we were not disappointed when Liz Tushingham served up excellent, tasty fare, just what tired and hungry sailors wanted. A big thanks to you Liz, particularly from me as she put aside mine while I tried to repair my boat. After lunch the fleet slowly dwindled with gear failure of one form or another, or just plain exhaustion. At the front it was obvious that either Tim or John were going to win, and at prizegiving we found out that John Taylor had won by 2 points, well done to both of you. Shaun Priestley was a worthy 3rd place, winning 2 races as well as putting a string of good results together. For me the star of the show was Damian Ackroyd in his newly designed and built boat. He only glued the two halves of the boat together on the Friday before the event, finished fitting it out on Saturday and launched it at this event the following day. Wow, and he finished 4th overall. Others to have their moments of glory included Derek Priestley with a win and a couple of seconds (also did more turns that anyone else), Dave Darwell who came strong at the end of the day, and comparative newcomer to Open Meeting circuit Geoff Martindale with a 2nd and two 3rds. Next event in the series, Kitridding, Saturday 9th Feb 2019, details to follow very shortly.